How Many Words Do You Need To Know (to be fluent)? Have you ever asked yourself how many words you need to learn in order to be fluent in your new language? This is a question we get quite often, and unfortunately it is almost impossible to answer… Let me ask you this: how many words do you know in English? Five thousand, ten thousand, fifty thousand? Chances are, you have no idea, right? Another problem with this question is that the definition of “fluent” in itself varies greatly for many people. What does “fluent” mean to you? Does it mean to be able to express your basic thoughts without too much trouble, or does it mean to able to write a comprehensive essay on the evolution of ancient Greece etymology? Even so, learning 20,000 words may seem like a daunting task, but keep in mind that words don’t have the same importance, not even close. In fact, the verb “to be” is used over 50 times in this video alone! That’s about 5% right there! While sources vary slightly, it is agreed that on average, the 3000 most important words make up approximately 90% of a language. So even though there are several thousand words, learning just a few hundred will make a huge difference on how much you understand a language. 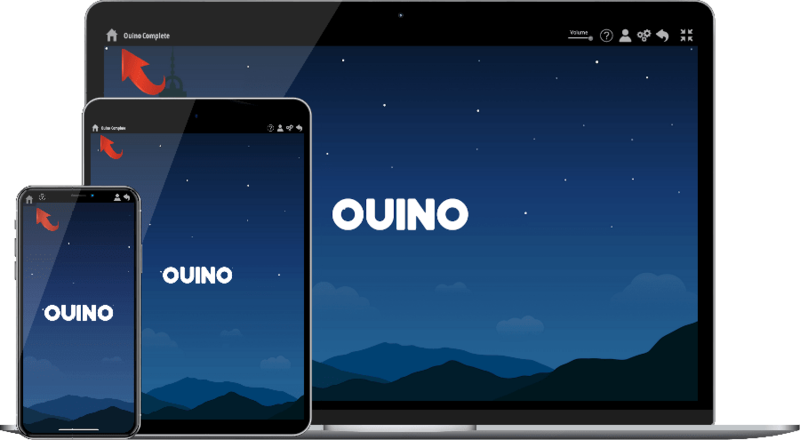 Ouino is a fantastic tool to learn the most important words in a flash. Once you know enough words, communicating and learning new words gets a lot easier. In fact, once you know the most important words, the remaining words will be better learned by actually communicating with people rather than learning from a computer program. Imagine you are putting together a huge 20,000-piece jigsaw puzzle. You have no idea what the final image will be. In this jigsaw puzzle, none of the pieces are the same size. How do you get started? If you want to know what the image is, your instinct will likely be to start putting the extra large pieces together, right? Exactly. Once you put the 3,000 biggest pieces of the puzzle together, you can now see 90% of the image but have only 15% of the pieces together. Now the image should be very clear, and knowing where to place the rest of the puzzle pieces should be much easier. You can now see what the image is but completing the rest of the puzzle will allow you to truly see the beauty of this masterpiece puzzle. Still following? Let’s venture even deeper in this great puzzle metaphor. What if all the puzzle pieces were to be blank? Every single piece, even the bigger ones; white as the north pole. It will be next to impossible to put the puzzle together right? A good learning method can put colors on the largest puzzle piece. Learning words is like adding beautiful colors to those puzzle pieces. After the main puzzle pieces are colored, the smaller pieces can be learned through association by getting out there in the world, watching movies, listening to music and speaking as much as you can. Words also need to be practiced in many different ways in order to strengthen their importance in your brain. Let’s say you learn the word “alfombra” in the Ouino language-learning program. You then watch the movie Aladdin dubbed in Spanish and hear the words “alfombra mágica” over and over again. You will realize in no time that it means “magic carpet”. But what if you didn’t learn the word “alfombra” before? There’s a good chance that it would take a lot longer to grasp the meaning because your brain just loves to simply ignore the things it doesn’t understand. Mr. Brain is quite picky that way. This is just one example of how multiple learning sources can work together. We strongly believe that immersion is the best way to learn, but also that a solid foundation is needed for immersion to work. There’s a level at which learning new words from context becomes a lot easier. When the language is completely unknown to you, it is very hard to learn words from context. On the other hand, when you know a certain number of words, you can start creating associations between words. Will a computer program like Ouino make you fluent and teach you all the words in the dictionary? No, it won’t. No matter what you hear or what people will tell you; Even the most expensive programs will not make you fluent, not by itself anyway. I would like to add that such a software does not need to be created. Reaching fluency without having any exposure to the language outside of your computer defeats the purpose of learning a language in the first place. Will a computer program like Ouino help you learn the first couple thousand words you need to get out there in the world? You bet it will! Your learning method should be able to help you avoid the unnecessary hassle of trying to put blank pieces together. It should also guide you to the point where communication gets a lot easier and it’s something that is essential to learning a language efficiently. Suirrpsingly well-written and informative for a free online article. I think your language tips are verbose and irritating. Just get to the point and teat your students like adults. You make points by putting up words on the screen running horizontally and vertically which is annoying and distracting. How can one maintain their focus when words are placed vertically on the screen? I know you mean well but I don’t have the time to listen to all the verbosity. Hey guys! I really like your videos, there’s great! Good advice! I am trying to learn Italian because my girlfriend’s family is Italian, I use your app too. 🙂 Can you release more of these? this User Guide. I wish I had it when I first bought Quino. It makes the program more complete. I look forward to viewing the videos.